Joe Schmidt’s men were handed an attacking lesson by the Wallabies at Lansdowne Road. 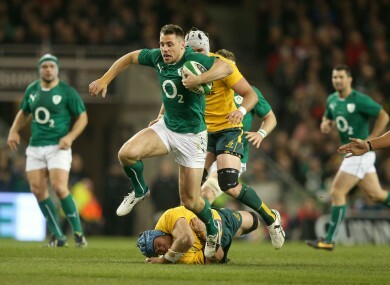 Tommy Bowe vaults over James Horwill. Still lacking that sparkle that won him personal accolades 18 months ago. Linked up well with McFadden on the left on a couple of occasions but suspect defence on show again. Stepped far too easily by Nick Cummins for Australia’ first try. Silly spill led to a successful Cooper penalty. Helped off holding his ribs near the end. Unwisely came in off his wing in the opening stages and a try-scoring chance was smothered out. Perhaps Australia targeted Bowe’s wing because they flooded it, and made hay, in the opening half. Was forced to choose from three men for Michael Hooper’s try and covered Cummins while Fardy found his back-row partner. One of Ireland’s best in attack and under the high ball and somehow hold Cummins up when his second score looked a certainty on 42 minutes. Missed his hit on Quade Cooper in the lead-up to the Cummins try. Rushed his defensive line on numerous occasions and while it worked moire often than not, Israel Folau left him for dead twice. Memories of the Lions second Test defeat to Australia must have came flooding back as Cooper went in between outside and inside centre to score a try that was far too simple. Was needed in defence more often than not in the first half as Ireland squandered possession. One fine looping pass set McFadden free up the left wing. Flummoxed completely by Cooper for his try as he bought the dummy the out-half was selling. Youthful energy meant he showed for the ball in attack throughout the final quarter. Ireland’s best back on show but he often cut inside for effective line breaks. Should have backed himself more, however, as he often slowed up in search of support. The injured Keith Earls would have pinned the ears back. Somewhere in the middle is Ireland’s best left winger. Had a curious mix of a game. Poor kicking from hand and one miss of a simple penalty but the man who drew in the most Australians and directed his team’s best attacks. Was bounced into the turf in one early tackle. was starting to motor when a suspected hamstring ended his involvement at half-time. His passing was not a slick and flat as it should be. He got in McFadden’s way to mess up a restart and often looked lost in midfield. Was guilty of setting himself, like Kearney, for Cummins’ try as the winger simply stepped inside and left him for dead. Hauled ashore on 56 minutes. Was on of Ireland’s better breakdown exponents but another who struggled to lay a firm hand on the likes of Folau and Cooper as they ran back Irish kicks with interest. The Irish scrum did not hold sway, as many predicted it would. Ran out of steam after the hour mark. Good, once again, at the breakdown but his lineout throwing looked less assured this week. Was tackled high and could not get the offload as a first-half attack was shut down. Outshone by his opposite number, Stephen Moore. Did not figure in too many attacking patterns. Was penalised at the first scrum but recovered well to achieve a measure of parity on his side of the pack. A willing ball-carrier and a constant presence in attacks but the most Ross ever managed to gain was a yard, maybe two. Referee Chris Pollock did not take a shine to the tight-head as he struggled to make a scrum impact in the second-half. One lineout spill in the first half and not as effective as his coaches would have liked in disrupting the Aussie darts. Showed great likes to support Bowe after the Ulsterman made a blistering break up the middle. His influence waned as the game wore on. Was a driving force for Ireland any time they chose to take it up the guts. One of the plethora of Irish players to bounce off Australian forwards and flail at gold-shirted backs. Will take it as a personal affront that he ended up facing the wrong way as the Wallaby rolling maul crashed over for Hooper’s second. Guilty of a over-enthusiasm at the start and gave away an easy penalty for Cooper to open the scoring. Could not haul Fardy down in time or do enough to prevent his offload for the Hooper try. Spilled the ball with the tryline beckoning from three yards out. Was lucky not to break any bones after he was speared into the turf by Kurindrani. Australia had O’Brien well marshalled and the game featured none of his customary breaks. Hooper and Ben Mowen shackled him in attack but his defensive scurrying was decent. Teamed up with Heaslip for one turnover but there was no magic, rampaging moment for the openside tonight. Final insult before getting subbed was to allow Nic White to scamper past without laying a mitt on the scrum-half. The situation was looking bleak for Ireland t one stage as Rob Simmons stepped by on Heaslip’s inside shoulder and needed Healy to save the day. Forced two turnovers in the first half as Ireland battled to stay above water. Appeared all over the park, in attack and defence, after replacing Sexton. Hesitant in the backline for Cooper’s try. A few aimless punts up the middle but an inventive tonic as Ireland sought to take the game to Australia. Replaced Reddan with 25 minutes to go and brought calm to his backline buddies. Snaffled at the ruck in the final minute and was adjudged to have knocked-on, peventing a late consolation for Cronin. Sean Cronin, Steven Archer & Jack McGrath: A collective 4/10 for the replacement front row as they failed to make a difference off the bench in the closing 12 minutes and even managed to crumble at a 5m scrum near the Aussie line. Cronin was denied a late try by the TMO. Mike McCarthy, Kevin McLaughlin, Robbie Henshaw: Not on long enough to rate. Email “Player ratings: here’s how the Irish team got on against Australia”. Feedback on “Player ratings: here’s how the Irish team got on against Australia”.